Pure Macrobiotic Salt Crystals are made by the natural action of the sun and wind on sea water from the Great Barrier Reef. They are free from processing and are unrefined, unwashed and free from any additives, or preservatives. Pure, unprocessed and unbleached. They are 100% concentrated ocean seawater. Very natural and very powerful! They contain over 40 naturally occurring sea minerals and trace elements. These crystals are suitable for adding to baths as an excellent way of absorbing all the minerals of the sea including magnesium chloride, potassium and calcium, to use in neti pots, or to make body scrubs. Also great for cooking! Australian Macrobiotic Sea Salt is made in covered pans which slow down the evaporation process, thus protecting the precious minerals and trace elements contained in the natural sea salt. When the salt is ready, it is harvested by hand and then allowed to drain (of excess sea water) in the sun before being packaged. It is free from any processing, it is unrefined,, unwashed and free from any additives or preservatives. This salt retains a pink-grey hue, being the most natural colour of sea water brine and a testament to the high sea mineral content. Hippocrates, the Father of Medicine, discovered the qualities of seawater when he first noticed the beneficial effects it had on the injured hands of fisherman, reducing infection risks, but also assisting with pain relief. It is now believed that sea water is effective in assisting in the rejuvenation of the cells and also induces a healthy exchange of minerals and toxins between the blood and the water. The benefits of sea salt are plenty. 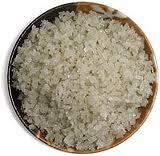 Sea Salt is so natural, easy, affordable and straight from the Earth! The idea of a sea salt bath comes from the knowledge that the ocean has great restorative powers. The human body is made of approximately 65% water. Seawater is very similar to human blood in its combination of minerals and trace elements and this helps to explain its effects. Adding dried seaweed to your bath further conditions, restores and moisturizes the skin.